It is that time again…. Kids are out of school for summer! I am always on the lookout for fun family games to fill up the rainy days when the kids can not go out to play or for game night. Recently I was introduced to MASTERMIND by Pressman Toys and was sent the MASTERMIND Attaché to try,it was a hit with my older boys! The Attache' MASTERMIND edition comes in a convenient zippered cloth carrying case with built in storage pockets. So it is easy to take the classic version on the go! I think this will be a must pack game for the family for our weekends at the fishing camp this summer! It's the code maker vs the codebreaker in this classic board game of logic and deduction. In order to win, players must use strategy and problem solving skills to outsmart their opponent. One player is the codemaker and sets a code of colored pegs. The other player is the codebreaker and attempts to break the code with help from clues given by the codemaker. Players take turns being codemaker and codebreaker and whoever breaks the code in the least amount of moves wins! Since it is for 2 players(ages 8 & up), when our whole family plays MASTERMIND we play tournament style, when someone wins they play the next player and so on. Our family really likes games, but as a mom I LOVE games that make my kids think and use there minds to play, which this game does! MASTERMIND is available in many different editions so there is one that will be right for your family! Visit MASTERMIND and take a look at their games. Follow us susan70070 and MASTERMIND on TWITTER then tweet which edition of MASTERMINDS you would like to win! Leave the link to your tweet and email in a comment! One winner will be chosen ! Contest ends at 11:59pm CST on 6/09/10. If the prize is not claimed in 48 hours a new winner will be chosen.Contest open to U.S. residents only. I would love the Travel Edition. 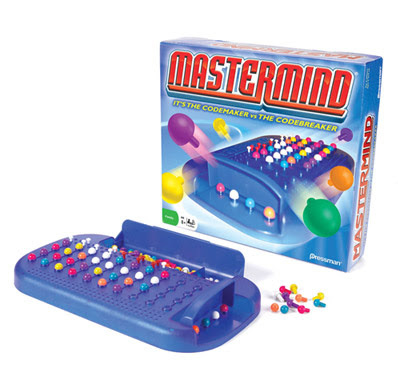 would love mastermind for kids. 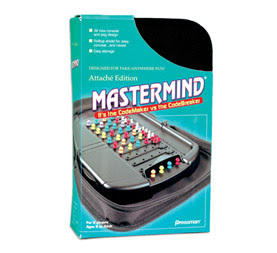 I'd love to try the MASTERMIND® Travel Edition.